A Foo Fighters fan with terminal cancer looks set to get his wish to meet the band after Dave Grohl heard his story. Australian Ken Powell, 56, put meeting the band on his bucket list when he was diagnosed with melanoma in 2009. The band toured Australia recently, but cancelled all meet and greets due to a bout of food poisoning. Ken had tickets for all six Australian dates and was devastated when he didn’t get the chance to meet his heroes. But by chance, one of his friends works for Qantas airlines, and was on board the Foos’ flight home. 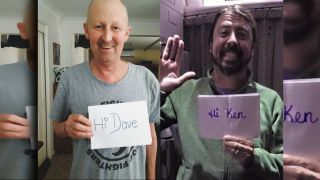 Grohl was moved after being told Ken’s story – and he’s sent a personal photo greeting as well as a bunch of merchandise. He’s also offered him VIP passes for a show in Los Angeles, which Ken is now raising funds to attend. A GoFundMe page with the aim of raising AUS$20,000 has already brought in almost half the amount. Any excess will be donated to the Melanoma Institute of Australia.